This video will show you how to approve time entries. This module allows you to approve or reject time entries. Step 1: Enter search criteria and then click the “Search” button. Step 2: Select the user(s) in the user lists, to approve/reject all their time entries. Step 3: Click the Approve/Reject button. Step 4: Click on OK on the confirmation pop-up. Step 1: Click on a user name from the list. Step 2: Select the time entries in the list to approve/reject. If you want to search for specific time entries, enter search criteria and click “Search”. Step 3: Click on the Approve/Reject button. Step 5: Click on OK on the confirmation pop-up. Step 3: Click on a time entry to see the details. 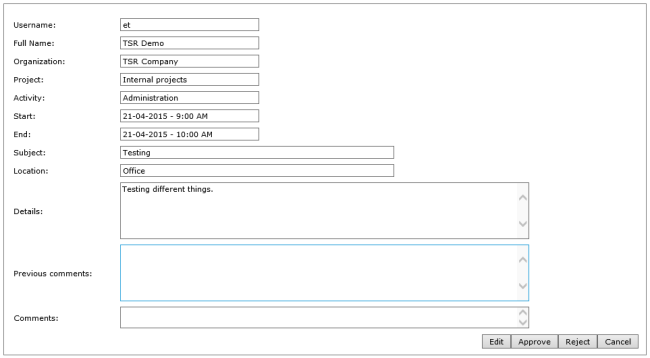 Step 4: Enter an optional comment for the time entry, or edit it if you wish. Step 5: Click on the Approve/Reject button. Step 6: Click on OK on the confirmation pop-up.